It is definitely starting to feel like Autumn around here. With that on my mind, I decided to make some stew for dinner and decided to bake myself another loaf of bread to go along with it. This is another bread that will contain Lactaid cottage cheese (which I am loving.) 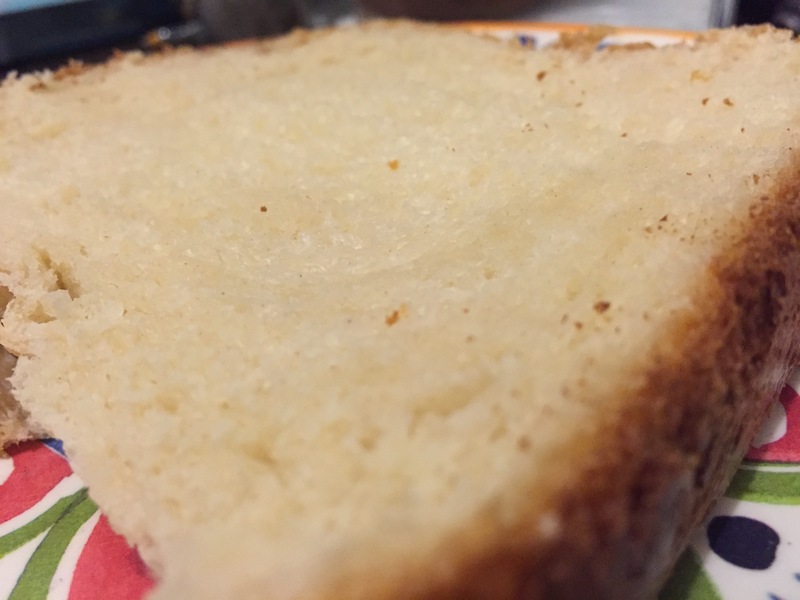 The author says that this bread is great for sandwiches, or even toasted and topped with more cottage cheese, applesauce, jam or olives. It is also noted in the cookbook that this bread keeps fresh for 3 days. Since the ingredients should be at room temperature before starting, I measured out my cottage cheese and let it sit, covered, on the counter for 20 minutes. Into the pan go: 3/4 cup water, 3/4 cup cottage cheese, 2 tablespoons olive oil, 1 1/2 teaspoons salt, 3 cups bread flour, 2 tablespoons sugar, 1 tablespoon gluten and 2 teaspoons SAF yeast. I am using the medium crust and basic bread cycle for this loaf of bread. This one wasn’t really fragrant while baking, but it rose nicely and has a lovely golden brown crust. The crispy, flaky crust surrounds a moist, tender and chewy loaf. There is a slight tang from the cottage cheese. It made a great accompaniment to my stew. I am looking forward to sandwiches with this bread in the next few days. It has been a while since I made a whole wheat loaf and I will be giving this to a local artist, Karen Brownlee as a thank you. During this year’s Peninsula Clay Artists Show and Sale she lead a ceramics workshop I participated in. Unfortunately, the totem I made in class didn’t turn out and she graciously offered to have me come into her studio and try again. In looking at the ingredients for this loaf, I noted the combination of buttermilk and maple syrup. I think that sounds delightful, so I hope she and her family enjoy the bread. I added my ingredients in the following order: 1 1/8 cups water, 2 tablespoons canola oil, 2 tablespoons maple syrup, 1 1/2 teaspoons salt, 1 1/2 cups whole wheat flour, 1 1/2 cups bread flour, 4 1/2 tablespoons dry buttermilk powder, 1 tablespoon plus one teaspoon gluten and 2 teaspoons SAF yeast. The recipe calls for use of the medium crust cycle and allows the baker to choose between the basic and whole wheat settings, I used whole wheat. This smelled great as it was baking, the tang of the buttermilk was certainly evident. It rose to a nice height and baked up without a crater, I call that a win. I didn’t think to get a photo of this one though. It was still warm when I was ready to deliver it, so I did a little research online and learned that the best way to transport bread that is still warm is in an open paper bag. Wrapping a warm loaf in plastic or foil will trap too much moisture. I hope Karen and her family enjoy it. I spoke with Karen today. She and her husband enjoyed it; but it was “too healthy” for her kids.